The park covers an area of 120 square kilometers, with 15 peaks of 1,000 meters above sea level The main peak, Tiantangzhai, with an elevation of 1,729.13 meters, is the second highest peak in Dabic Mountains. In ancient China it was the main pass between the slates of Wu and Chu. Due to its strategic position, it was the locus of warfare for centuries. The sites of stone villages, ancient fortresses and military parade grounds can still be found on the mountain. the scenic lbresls are the main attractions of the Tiantangzhai National Forest park, covering 95.4 percent of its total area. Nearly 3,000 species of valuable plants grow here. It is home of more than 1,400 species of plants and 120-odd species of animals, of which more than 40 plants and trees, and more than 20 species of animals, such as giant salamanders and leopards, are under state or provincial protection. 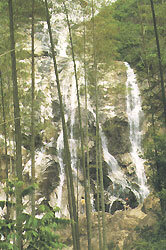 The Tiantangzhai Forest Area boasts of abundant water resources, steep mountains and over 100 waterfalls of various sizes, of which 18 have drops of over 70 meters each. This area is known as a "cool world, summer resort, kingdom of plants, paradise of animals, land of azaleas and home of giant salamanders."